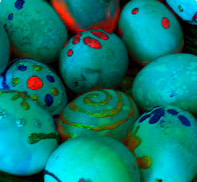 Easter egg was traditionally the dyed or painted chicken eggs, but now it is substituted to chocolate eggs, or plastic eggs or Handmade Easter Candies filled with confectionery such as jellybeans. These eggs are often hidden, allegedly by the Easter Bunny, for good children to find on Easter morning. Easter egg colouring, Easter egg rolling (a popular Easter game in US), Easter egg pushing with a spoon and Easter egg hunting are the common festive activities. Eggs had a religious significance in many ancient civilizations; Egyptians and Greeks buried eggs in their tombs and Roman’s proverb says, "All life comes from an egg". From the earliest times, the egg was a symbol of rebirth in most cultures.